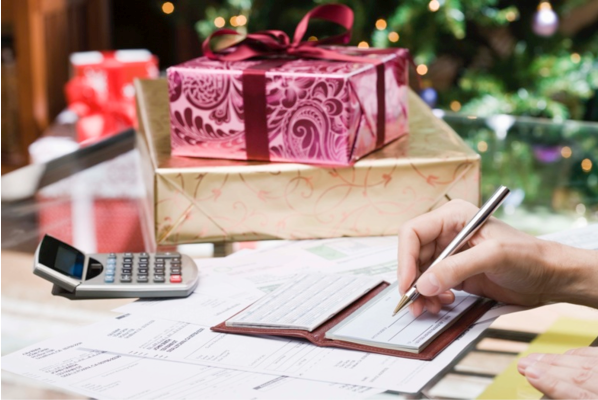 Seven ways to manage your money during the festive period. In the land of retail, Christmas has well and truly begun. Decorative reindeers are being dusted off, festive ice rinks are popping up and glossy, emotional adverts are filling our screens. With shopping centres transformed into magical grottos and shops stocking products we never knew we needed (Christmas bedding anyone? ), this time of year always creates the temptation to splurge. And even if you are careful, the cost of enough turkey and trimmings to feed fifteen can be enough to ruffle your feathers. With huge costs and tight budgets, money worries can threaten to dampen the festive spirit. According to the Money Advice Trust, on Boxing Day last year three times as many clients called needing debt advice as they did on the same day in 2013. However, it is possible to keep the sparkle without overspending. You don’t have to feel pressured to spend more than you can afford- here are seven ways to take control this Christmas period. Embrace your inner accountant and make a mini budget. It doesn’t have to be anything complicated – just a list of what you have to buy and how much you think it will cost. Write a list of relatives and friends you want to buy presents for, and how much you want to spend on them (if you already know specific presents, all the better!). Once you’ve added up your spending, you can make cuts and savings accordingly. There are some people you wouldn’t dream of missing from your Christmas list, and there are those where it’s simply become a habit. If your gift giving has become no more than a money/calorie exchange, or you find yourself spending too much just to maintain appearances, it could be time to make a mutual pact to stop. It’s likely the other person feels the same! If you don’t want to stop the gifts entirely, you could also try a ‘Secret Santa’ in your family or friendship group where everyone gets one gift each. As for small children, often the wrapping paper and the boxes can be just as exciting as the present, so don’t feel you have to buy the most expensive toy. Unless you’re a wrapping paper connoisseur, it’s likely that Autumn/Winter 2015 reindeer designs will be just as appealing as 2016’s snowflakes. If you can face it, bulk-buy various wrapping papers, crackers, gift-tags and Christmas cards in the sales after Christmas and put them in a designated cupboard. (Maybe somewhere next to the ‘random selection of birthday cards and fancy dress outfits’ drawer). Whereas the toy cars and Barbie dolls of your childhood Christmas may have faded from your memory, you probably remember the feelings of togetherness that come with playing games. They’re refreshingly easy and don’t cost a penny. Charades and Pictionary are classics – all you need are teams, pens and paper. More adventurous options include the Cereal Box Game – everyone takes it in turns to try to lift a cereal box off the floor with their mouths without their hands or knees touching the floor. With each round, an inch is torn off the box. Another crowd pleaser is Spot The Intro – simply find a playlist and put it on shuffle. The first person to guess the full song and artist wins. You don’t even have to keep score, and it can go on for hours. Using a credit card can be a great way of spreading the cost of Christmas, as long as you use it carefully. Firstly, make sure you’re using the right credit card. Many cards offer 0% interest and some for up to 27 months and this can be a great option if you are going to pay off your balance in full by the time the deal ends. Some cards offer high cash back rates on your first few months’ spending, but if they have introductory offers make sure you know when they end so you’re not hit by high APR rates. Secondly, make sure you’re making repayments. Set up a direct debit to pay your balance in full every month so you’re in control. Store cards can seem tempting, especially when they offer discounts such as 20% off your shopping. However, they often come with much higher interest rates than ordinary credit cards, so never use them to borrow. If you do use a store card, pay back the full amount you have borrowed immediately. Taking out a store card will involve a hard credit check on your file, and too many checks can damage your credit score. To be safe, Money Saving Expert recommend not applying for a store card just before before applying for a mortgage, loan, insurance or a mobile phone contract. In January, check your credit score and report to make sure everything is in order. You can see your credit report and score for free with a service such as ClearScore. ClearScore shows you the data held by Equifax, the credit reference agency used by over half of lenders*. To get the full picture you can also see the data held by CallCredit for free (used by fewer lenders but nonetheless worthwhile) through a service called Noddle. Experian also offers a credit rating service, but charge £14.99 a month after a free month’s trial. There is no need to pay if you don’t want to- between Equifax and CallCredit, the lion’s share of popular high street providers (and all mobile phone, broadband and TV providers) are covered. You can take active steps to improve your credit profile and keep tabs of any changes, or any usual activity on your account using ClearScore’s personal dashboard and free monthly alerts. Perfect for your New Year’s Resolutions. Take control of your finances. View your credit score for free, forever with ClearScore. *According to Money Saving Expert, 2/3 of providers use data from Equifax and Callcredit. Full details here.